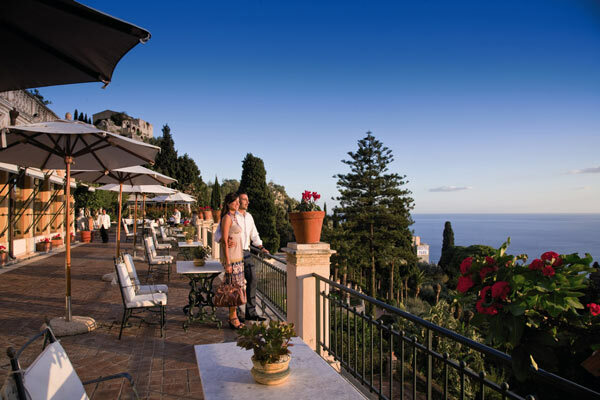 Set in the centre of Taormina, in beautiful gardens, the hotel enjoys unrivalled views of the coastline and Mount Etna. Adjacent to the Greek Theatre, it is surrounded by stylish boutiques, cafes and cultural attractions, and has been welcoming guests, including famous artists and writers, since 1873. Its renowned Literary Terrace is an elegant place to relax and enjoy the vistas. Most guest rooms, decorated with Sicilian baroque flourishes, enjoy sea views from their expansive balconies or terraces. LOCATION: In central Taormina on Sicily's east coast, 50 minutes from Catania Fontanarossa International airport. ACCOMMODATION: 70 suites and bedrooms. DINING: The restaurant serves Sicilian and Mediterranean gastronomic specialities. Pool restaurant serving oven-baked pizzas. The Literary Terrace with a piano bar. FEATURES: Heated outdoor swimming pool. Gym. Wellness centre in garden. Private shuttle to and from the private beach and Kids' Club at sister property Villa Sant'Andrea. Conference centre with 3 rooms for banquets and events, 6 acres of verdant private park.